So that’s how The Great Closet Purge came about. I realized that there were just too many things that I was holding on to that I need to release. Like many others, I read (most of) The Life-changing Magic of Tidying Up by Marie Kondo (affiliate link) and was inspired to do a complete overhaul of my home. But (like some others, I assume) I never got around to actually doing it! Well, I’m not committing to a whole home declutter just yet, but I am going to start with my clothes and maybe that’ll inspire me to move on to other parts of the house. This is going to be really casual. I thought about this a couple nights ago and thought I’d throw it out there. I thought it would be fun to get other people on board for extra motivation and accountability. Anyone who is interested in doing a big wardrobe purge, I encourage you to join! No real rules or anything, just participate however you want or can, but I will have some tips and suggestions along the way. NOW! Sorry there isn’t a lot of warning here, but this is flash mob style. I really believe that you can’t wait for the right time or plan ahead – when you have the energy to do it, you just have to go for it. If you wait, that fire is just going to fizzle out and it’ll be too late. So start now, or if you already started earlier, finish it now. I’m setting the end date of next Sunday, June 14, just so we have a deadline (can’t drag it out forever). If you can’t get it done in that window, that’s ok! Just do what you can. So the dates are June 6-14, 2015. You’ve got two weekends and the week in between. EVERYTHING! Kidding, but not really. This challenge is focusing on clothes, but that includes not just your shirts and pants, but jackets, socks, underwear, shoes, hats, scarves, everything. Make sure you dig everything out of everywhere – laundry room, under the bed, in the “to mend” pile, in the hallway closet, etc. Start by throwing all your dirty clothes in the laundry and while that’s in, start with whatever feels easiest and dive in. Alright, I’ve got some ideas and suggestions that I’m going to share really soon, but I feel like that’s enough to get you thinking and maybe even get you started! 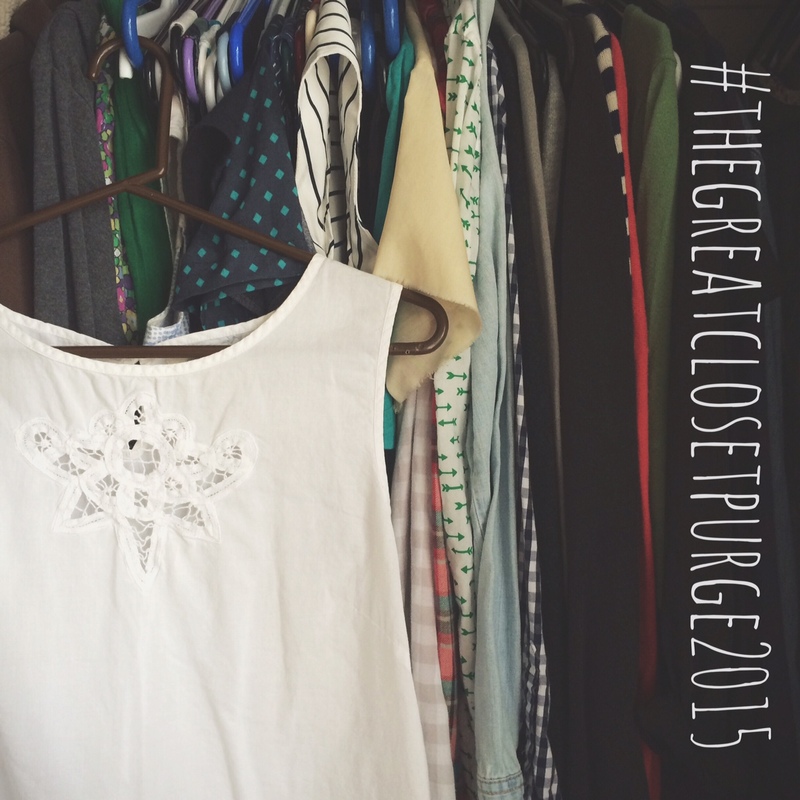 Oh and if you want to join in and post your progress, advice, frustrations or hesitations on social media, be sure to use the #thegreatclosetpurge2015 hashtag (long, I know) and that way we can all support each other!! Are you in? What’s your best piece of purging advice?? This entry was posted in announcement and tagged declutter, purge, The Great Closet Purge by Cherie. Bookmark the permalink. I took on closets after reading Kondo’s book following her strict instructions. One closet had already been purged so I skipped it. My focus was on two main closets. I took out everything. Every.Thing. Shoes, bags, junk boxes, robes, belts, shoes. I put everything on the floor and bed. When I got through, I discovered I had 9 pairs of black pants (two of them identical). Who knew? The end result is that I now know what is in my closet and what to look for when I go shopping. There is no vague notion of what I have. I donated 8 bags of clothing to Purple Heart. I did one handbag for sentimental purposes, otherwise, everything in my closet is something I wear. Seeing as I spent yesterday going through my daughters clothes to purge and ended the day with 3 huge garbage bags full alll ready to take to the clothes bin. The only reason I got all that done so quickly is because I’ve been putting off doing my own wardrobe for the past few weeks. I suppose in some small way I felt like me putting off my wardrobe for another day was justified by turning my little girls room upside down instead. But after reading this and having a little chuckle to myself, ive decided theres no time like the present and the fact that I’m going to have company whilst doing it helps me feel like my procrastinating the last few weeks was all for a good cause. I’m in!! I’ve just dug out all my winter clothes (down here in South Africa the cold weather is setting in) and have already realised that I haven’t worn at least half of my scarves in the last TWO winters. Those unloved have got to go to someone who appreciates them! Afterwards I really feel relieved. So I think, you’ll have a lot of fun during the purge. My friends and I do this several times a year and then get together for a naked lady party. We go through the discarded clothes one at a time and people claim them if they want to try them on. If two people (or more) want the same thing, we all vote on who looks best in it and that person gets it. The leftovers no one wants goes to a thrift store that supports a domestic violence ministry. It’s a fun excuse to purge the closet AND drink cocktails. I love that idea, and the voting aspect is a really good way to decide who keeps what! Just need a group of people to get involved!! Haha, that sounds so fun and awesome!! I’ve just done this recently too, such a good feeling! I will join in! What thoughts do you have on donating versus refashioning? I tend to move a lot of clothes from the wardrobe to the refashioning pile which doesn’t actually purge them… Seems like cheating! Any thoughts? Count me in. I’ve needed to do this for quite some time. I’ll keep ya posted lol. Awesome! Hope it’s going well!! I’m totally purging my wardrobe right now too! I’ll enjoy reading your advices ! I do it twice a year, in spring and in fall. I did discover that during summer, I wear only black or white (or black and white printed) tops. I keep a bag with a-bit-too-large things, for later pregnancy or something, but everything too tight will be too tight forever. Did this recently (winter) and felt so oddly happy after…and now ready to purge again now that summer is here. I just did a purge recently, probably a few months ago…and I’ve just started a new one! I saw an article online about a woman who keeps her wardrobe at a maximum of 30 items and if she buys something new she has to get rid of something else. Very inspiring…don’t think I could ever bring myself to cut down to only 30 items though! It did make me realise how I only wear a small percentage of my wardrobe – however, I still like having a few of the ones I only wear once or twice a year for special occasions. I’m looking forward to seeing how yours goes… oh, and a tip. If there’s things that you can’t bring yourself to throw out put them aside and give yourself a deadline – if you don’t wear them before that deadline then chances are you never will and it’s time to say goodbye! Yes, I’ve heard about the idea of getting rid of someone if you want to add something. I’m curious how many pieces I own – I might have to go count. Though I’m quite sure it’s more than 30. Love the tip about a deadline – I did that with a couple of items! Haha, I know, I’m scared to count. I get to 30 on winter coats and jumpers alone. I dread to think of the grand total! Good luck with your endeavours, I look forward to seeing how it goes! I was doing the big declutter last year and did okay, but it’s all come back. I’ve gone through the kids books and downstairs toys now and that helped, however, I did a closet purge and it is sooo liberating. So many things were filler (that happens after two babies and a career change to SAHM) and letting them go helped me learn what I had and what I really need. It’s hard as there are holes, but those were their before, just hidden. Now the fun starts of being able to make the wardrobe I really want. My closet is still clutter free. The best of luck to any one brave enough to do it. Really cleaning out is awesome. Go you! That’s great! Thanks for sharing – I definitely think that decluttering is an ongoing process, especially with kid stuff because so much continues to come in (even without your control sometimes!). But I love the bit about learning what you had and need and being able to see the holes that were previously hidden. Makes so much sense!! Hi Cherie, I did the Marie Kondo “KonMarie” technique a while back and had a few blog posts written about my experience. So far, I am really surprised on how easy it is to maintain a small wardrobe and how easy it is to organize them. All I can say is that pick a day that you will commit (like what you mentioned), fuel yourself (nice, big breakfast), burn a candle, turn on a music (or anything that will motivate you) and just do it. Decluttering has certainly released a huge burden of ownership and I’ve never been happier with my wardrobe since, so much so that I think twice/trice before adding any new clothing into my wardrobe. I also do this with my little one’s wardrobe. That was another story, definitely more sentimental & harder to give up. I don’t like getting rid of clothes. I believe that there are several ways to recycle. Like sew the edges and fill it with stuffing to make it into a pillow or reuse to fabric. I’ve just recently done a closet purge as the school are doing a clothing collection to raise money. A clearout was long overdue and was this a great motivator. The collection is this week and I hope they raise lots of money for the school. I think I’m due for a closet purge. Especially my t-shirt drawer; I really only wear the few that are crammed in on top; I have no idea what’s down deeper… Take notes on what you donate! it helps a lot when tax time comes along next year. I know what you mean! I actually got rid of almost all of the t-shirts in my drawer except for the few that I wear regularly. Phew, so much easier to open that drawer now! My biggest issue is maternity. Im a size bigger now but hold out hope i will shrink a bit (its been a year lol) as my clothes are still really nice but all a bit tight 😦 Do i keep them, do i throw them?!? My favorite way to purge is on a Saturday morning, after having a couple cups of coffee, with music blasting. This way, I can try and convince myself that it’s not a chore. I also give myself a time to stop otherwise I could just go on forever, and I give myself a maximum number of clothes to give away. I’m not sure about anybody else, but since I’m in law school and don’t have an income, updating my wardrobe can’t be done immediately rather only a few pieces at a time. Then, I don’t give everything away at once and leave myself with nothing! I did a huge declutter while I packed up for a move, it feels like I’ve downsized my wardrobe a little bit. On the one hand, I didn’t wear any of the clothes anyway, but on the other I feel like the clothes I do wear need some sprucing up. Out with the old and in with the new? I would love to do a closet purge, honestly. But I just don’t have the $$ to go out and buy a whole fantastic new wardrobe, even if it was from the thrift store. (Which I prefer because then something was gently loved can get loved again!) But yeah, this is actually a great idea, and maybe at some point I will attempt it. Sorry for the late reply. I just discovered your blog. Your handmade items are pretty!! Do you think that you can just purge all the things you don’t need and keep the things that you do need and love? You don’t have to get rid of everything and start from scratch – I think just getting rid of the excess and keeping what you really like is great too! Possibly. I will have to get back to you possibly in the Fall and let you know what I end up doing. Thanks so much for the idea and inspiration. I love your blog and id love for you to check out my blog its gabrielleleighcooper.com and follow me I followed you as well. I’d love to work with you and talk about post and give each other blog post ideas and collaborate. my number is 571-232-6478 my name is Gabby Cooper you should text me s0 we can be blogging buddies. I’d love for you to be my mentor and help me blog better. I’d pay you for your time.